Overall size: 26" x 31½"
The German Me 262 jet fighters, used primarily to attack USAAF heavy bomber formations in early 1945, were very vulnerable to fighter attacks during take-off and landing. 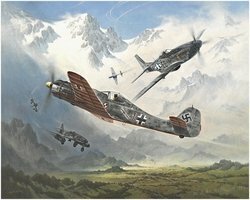 The Allies had therefore adapted a strategy of having fighters patrol in the vicinity of Me262 bases, waiting for the return of the German jets from their missions. These ambushes soon proved highly effective, with the Luftwaffe losing many jets to the guns of the USAAF. To counteract the mounting losses special units were formed, equipped with the Focke-Wulf 190 D-9 ("Dora Neun"), regarded by many as the Luftwaffe's finest piston-engined fighter of the war. Manned by experienced veterans of JG52 and JG54, they were tasked with providing top cover for the jets at their airfields at Munich, and Ainring near Salzburg. In order to make these aircraft clearly discernable to the German anti-aircraft gunners, their undersides were painted red with white stripes, thus the legend of the "parrot wing" was born. One of this unit's elements was the so-called "strangler swarm" led by Lt. Heino Sachsenberg. Here we see Sachsenberg in his Focke Wulf 190 Dora 9 "Rote 1" W.Nr. 600424, as he turns into P-51s over the airfield of Ainring in an attempt to protect the approaching jet fighters from the Mustangs' attack.